What are the best iPods/MP3s for swimming? … top 7 waterproof iPod/MP3 + headphone sets that are perfect for swimming, even underwater. Click here, for waterproof Bluetooth headphones. In the comparison table you can compare best waterproof iPods with other brands of swimming MP3 players. 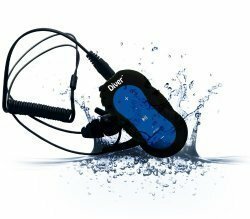 Know About Better Waterproof MP3 Player? This technology is very basic, but works best underwater. See why you can’t use Bluetooth headphones underwater below. There is no waterproof iPod Nano that you could use for swimming without any additional protection. What you can do is get regular iPod Nano and protect it with waterproof bag. Get some good water protected headphones and you’re good to go. 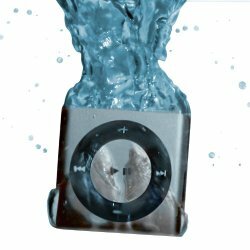 All of the iPod/MP3 sets on this list are perfectly safe to use for swimming in pools and some are protected from water up to great depths. To fix that problem for you, we recommend you get better waterproof headphones. Sure, these are a bit pricey, but you get what you pay for. If you want the best possible experience in the pool, get one of these Swimbuds made specifically for fast, underwater swimming. Swimbuds 100% Waterproof Headphones Designed for Flip Turns! $40 model designed for fast flip turns underwater. Durable, comfortable with loud and clear sound. 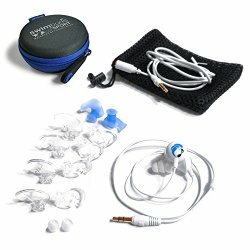 With great selection of quality ear tips that keep water out and earbuds in your ears. Get these headphones for best swimming experience. Keep in mind that wearing a swimming cap can really help with stability even when using Swimbuds. Bluetooth headphones don’t work under water because the signal doesn’t transmit the same way underwater as in the air. This makes wireless Bluetooth headphones useless for swimming. For above water sports like kayaking and board paddling you can still use waterproof wireless headphones. This is a top rated iPod for swimming on Amazon.com for a reason. Earbuds are 100% waterproof and you don’t have to worry about getting them wet. The only problem water makes, is that it slightly changes the sound if you don’t have the best fit. But for most people this is not going to be a big issue. It features 2GB of space which isn’t much compared to today’s MP3s, but is enough for over 500 songs and considering this is Apple Shuffle (no screen) you’ll probably never want more songs than that. The sound quality is pretty good, especially considering this is an MP3 set for swimming purposes. It sounds the same as regular iPod Shuffle. Clean, detailed and balanced sound you can enjoy on the go. 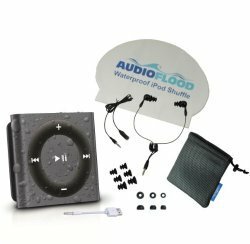 If you’re looking for, small, durable, waterproof MP3 player you can go swimming with, then look no further, get iPod Shuffle by AudioFlood and never again suffer the silence even if you’re 200ft under surface. Waterfi iPod set is slightly more expensive and comes with less accessories; otherwise it’s at least as good if not better. It can be conveniently strapped on to your goggles or wet suit and because it’s so small and light it won’t bother you. The wires are slightly longer than with AudioFlood version at 11 inches which might be a nuisance since the cord flaps around a lot underwater. But for some people the cord is still too short causing frustration during swimming. Additionally you get different sized ear tips and original, non-waterproofed Apple earphones. The waterproof headphones might have a bad fit for some people, in this case you should look into Swimbuds Sport, which are the best headphones for swimming on the market right now. Click here for more info. This waterproof shuffle comes with a battery life that lasts up to 15 hours and can store at least 500 songs/podcasts in 2GB of on-board storage. Sound quality isn’t any different from the standard iPod, after all it’s the same product, just made waterproof. This doesn’t mean sound quality is bad, in fact it’s among the best you can get for swimming. 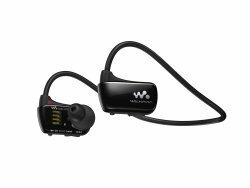 The set is quite pricey for such a small MP3 player, but when it comes to underwater performance you will have a hard time finding better. Apple is known for producing top notch products and to really have no worries about using it underwater you get a 2 years waterproof guarantee by Waterfi. If you want a durable and reliable iPod for swimming, Waterfi version is one of the best and with proper maintenance it will last you for years. FX-Sport VR1/VRX are slightly different waterproof headphones because they don’t use the in-ear monitors, but rather on-ear headphones. These are designed specifically for various sports, including swimming. Their smart design and good sound quality makes them a great choice for any semi-serious swimmer. VR1 is not compatible with Real Life Coaching Apps and has a slower charge speed, otherwise they are basically the same headphones with the same drivers. VR1 charge time is about 5 hours, VRX charges up in less than 2 hours. If you’re not interested in using Real Life Coaching Apps go for the VR1 version and save some money since they are a bit cheaper. For swimming purposes FX-Sport VR1/VRX aren’t “swim-ready” out of the box, you have to purchase an additional accessory which is basically a silicone Swimcap for the MP3. Together with the swimming cap you can safely use the MP3 player in the water. One of the most annoying problems with waterproof headphones is getting water in the ears. FX-Sport VR1/VRX do a better job at keeping water out. Just don’t take them ocean diving with you as they’re probably not made to survive the pressures deep underwater, snorkeling on the other hand is fine, but that wouldn’t be smart for security reasons. You need to hear what’s going on around you when diving. The built quality is good, it’s sweat resistant as well so you can easily use it for other sport activity. The headphones are made out of plastic, but the better kind which doesn’t make you worry of breaking them. The fit is surprisingly good. Because of their plastic design they are light and once you hook them to your ears they stay put. To keep it in place in water you need to use a swimming cap which you get together with the Swimcap accessory. Once you put it on they don’t budge. Approximately, it takes 2-3 minutes to adjust everything so this isn’t very long for a hassle free swim of an hour or more, depending how long your swimming sessions are. They’re comfortable enough for a workout, but since they are on-ear design your ear lobes will get a bit irritated if you wear them for half a day. With 8GB of on-board space there is plenty of room for your favorite music, additionally you can download one of the many certified training programs from their website. It is also iTunes compatible, just connect with a PC and add your favorite songs. We noticed a small battery drain when not in use, so if you don’t use the MP3 for a while after being fully charged, keep in mind that the play time will shorten for every day not in use. It seems the device is never fully shut down. To solve this, just charge it before using it. The controls are quite easy to use once you get used to them. With a bit of time you will learn how to change songs even underwater. Sound is very good compared to other waterproof MP3s, this is because of a completely different design. For a waterproof design that enables you to swim or workout with a good sound quality, great fit even underwater, FX-Sport VR1/VRX are the best on-ear headphones with MP3 you can get right now. 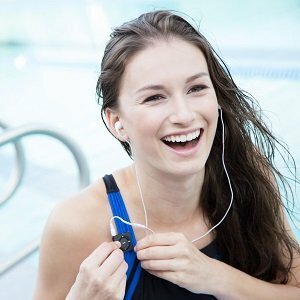 Swimbuds™ are the best earbuds for swimming you can get right now, you can check them here. The iPod Shuffle itself is waterproofed by Underwater Audio which specializes in swimming accessories. It is the standard 4th generation iPod Shuffle. 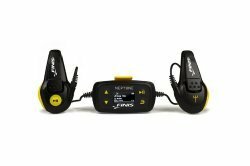 The exact depth this MP3 is safe to use is not specified, but is more than suitable for in pool use and even diving. Durability is the same as with regular iPod. It’s small and compact, but works like it’s supposed to. Can be used in salty water as well, just make sure to clean with a splash of fresh water afterwards to get the salt off. With proper care and 2 year warranty, you’re guaranteed to get a lot of use out of it. See more durable earbuds here. Small and compact design makes it easy to attach to your swimming wear or swimming cap. FINIS Neptune is something completely else that you’ve probably never tried before. It uses bone sound conduction. Basically the sound is transmitted through your jaw bone to your ears so you don’t really need headphones. This means less of a chance for water to break anything. There is a newer V2 version of FINIS Neptune, but it’s not as good as the first version. We recommend this one as it has better durability and doesn’t lack any features that the V2 has. It’s waterproof up to 10ft (3m) of depth which is a bit less than the comparable MP3 players, but still enough to swim in a pool with. As long as you don’t intend to snorkel or dive with it, it should survive long enough to get your money’s worth. Generally, durability isn’t top notch, but it’s good enough for the price. The MP3 seems a bit plasticy, but this is standard in this category. Since these don’t have earbuds, you don’t have to worry about the fit or them falling out. You simply put it on, touching your jaw bone, press play and it works. 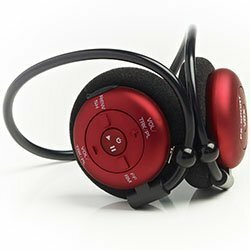 This MP3 player is a great alternative if you have problems keeping earbuds in ear while swimming. Using FINIS Neptune this can’t happen. Since there are no earbuds or speakers being used it doesn’t matter if water gets into your ears, it doesn’t affect sound quality. It has 4GB of space which is plenty, for over 1000 songs in MP3 format. Getting the songs on is as easy as copy/pasting when you install the right software, but note that it doesn’t support iTunes. The battery is charged via an USB cable and is supposed to give approximately 8 hours of playtime, though the actual battery life is slightly lower. You can expect about 5 hours out of it, still more than enough for one swimming workout, unless you’re a marathon extremist. It also features an OLED screen to show you which song you’re playing. This is only useful when you’re not wearing it on your head, but it’s a nice bonus that other waterproof MP3 players for swimming don’t have. The sound quality is just about average, like with most waterproof MP3 players for swimming. The bone transmitting technology doesn’t give the clearest sound, it’s a bit muffled, but for in-pool use this is more than good enough. There is one problem with it, if you are swimming in a technique that requires your head to move in and out of water frequently, you should know that sound changes noticeably when you do that. For many people this is a deal breaker. If you keep your head mostly underwater it should be fine. In the end, if you don’t like how headphones behave underwater and want something more reliable, you should check FINIS Neptune which offers music in a new way that works at least as good if not better than regular headphones. This was one of the first MP3s that featured waterproofed design and it’s still one of the best choices if you want to listen to music near water. They aren’t the best for swimming, but do many other things better than the alternatives. For on land use, it’s great for running, working out or any other fast activity. The fit is stable and doesn’t fall out, unless you use it underwater. By wearing a swimming cap you can improve the fit and greatly remedy the constant fit problems, but in the end you can’t make the MP3 smaller. The battery charges in about 1 hour and gives from 6-8 hours of playtime, depending on how loud you play it. This are solid features that don’t disappoint. The sound quality is nothing special, it especially lacks in bass, but for swimming purposes you don’t have that many better choices. This is the budget, low-end waterproof MP3 but it still does it’s job well. The build quality and the feel can’t compare to iPod Shuffle, but it’s good enough. It’s completely waterproof and you can easily use it in the deepest pools (can easily survive 24 hours underwater). Just don’t go diving deep in the sea with it. The problem that seems to face all waterproof MP3 player sets is the headphones. If you dive in too deep or too quickly, the water fills your ears and muffles the sound. This is an even bigger problem with rather cheaply made headphones that come in the Diver set. Using Swimbuds and a swimming cap is highly recommended to keep the water our. Your experience in the pool will be much better. It charges with regular USB cable and the battery lasts about 3 hours per charge in general. This isn’t as good as an Apple iPod, but it is to be expected as this is a more budget friendly product. Generally, it the bass isn’t anything special and the accuracy and details aren’t mind blowing. It is a budget model after all and the expectation of sound quality should be lowered.